By James E. Quinlan. One of the most dramatic tales from early pioneer America, the story of Tom Quick and his one-man war against the American Indians still arouses strong emotions to this day—especially amongst the descendants of his victims, to the point where his monument was attacked and taken down as recently as 1997. Born in 1734 of Dutch ancestry, Tom Quick lived in peace alongside the Indians for the first part of his life, learning their language, hunting with them, and discovering all of their ways. His path ran up and down the Delaware River, and Indians were frequent guests at the Quick household. The Indians, however, soon realized that increasing white settlement would ultimately deprive them of their land, and decided to attempt the extermination of all the Europeans along the Delaware. The Quick family were some of the early victims, and Tom witnessed his father being brutally scalped while still alive. He acquired the title of “The Avenger of the Delaware” and the rest of his life was caught up waging war against the Indians. Soon his exploits became legendary—amongst both Indians and whites. Time and time again, he avenged Indian massacres with equal brutality, and somehow, even though often captured, he always escaped to carry on his private war. He seldom mixed with other whites, and was often only in the towns long enough to procure more ammunition in exchange for the animal skins from which he made his living—and then would disappear once again into the woods to pursue his deadly aim. Tom Quick’s story weaves in-between that of the early settlers, the brutal French and Indian Wars, and finally the American Revolutionary conflict. This no-holds barred description reveals in gory detail the brutal racial war waged between Indians and whites—and the British use of Indians to murder and attack settlers in early America. Tom Quick’s true story is one that is now suppressed by the dictates of present-day political correctness—but this does not affect its veracity or historical importance in understanding the dynamics of racial conquest and conflict. About the author. James Eldrige Quinlan (1818–1874) was born in the state of New York and owned the DeVoe and Quinlan Publishers in Monticello, NY. He was also editor of the Monticello Republican Watchman newspaper from 1838 until 1866. 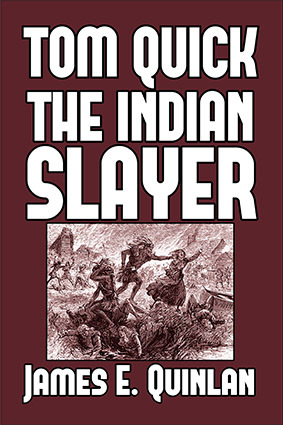 He won fame for his publication of Tom Quick the Indian Slayer in 1851. He was also instrumental in ensuring the location of the Monticello Academy in Monticello, NY.